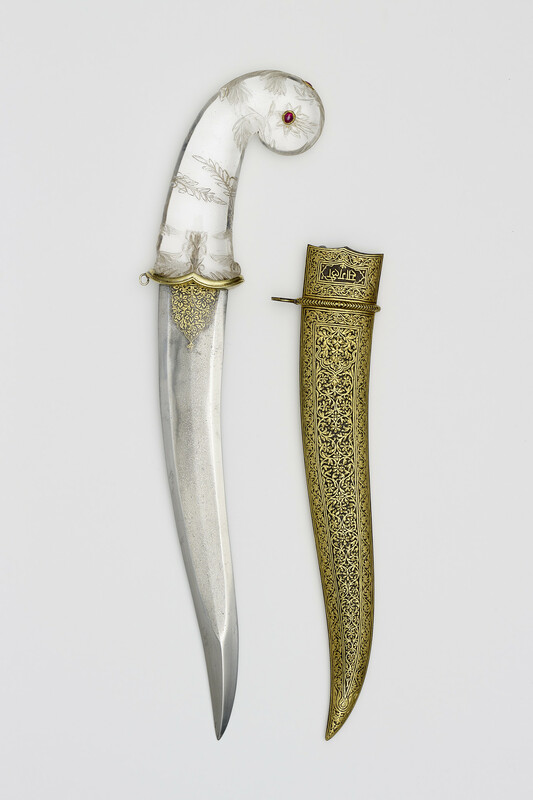 A dagger or khanjar with a two edged re-curved blade thickened at the point. The top section of the blade near the hilt is overlaid with gold patterning, an Indian technique of patterning sometimes described as false-damascening. The rock crystal hilt inlaid with rubies and is carved with floral designs to disguise the inclusions. The steel scabbard decorated with overlaid gold floral patterning is likely to be a later addition, with the inscriptions reading 'Sangli' in English and Marathi marking it out as a presentation piece.